My friend Steve and I headed off for 3 days of relaxing up the Dosewallips River drainage. We would also be walking on a section of the Pacific Northwest Trail. The primary reason of the trip would be to plan our Bailey Range Traverse. What better place to do trip planning, than in the Olympic National Park. This would also be perfect training for my trip in a few weeks. It was impressive to see the effects rapid snow-melt in the Park. The weather also added to river volume. A perfect chance to test some gear in rainy, damp and cold conditions. This would be the first part of my 7 days in the backcountry. After resupply I would head into the Quinault drainage. Steve reflecting into the Dose. Walking on the Pacific Northwest Trail. 'Super Mice' got into my food on the ONP Bear Wire. Chewed right through my LiteTrail Odor Proof Bag. Granted, these mice are trained to get food from these well used campsites. Main reason I hate hanging my food on established wire. This is the 5th time I got robbed. Using my own line now on. Hope the mouse was 'satisfied'. There is a ghost on the PNT. Seen 1 Black Bear in the trail. This is an old melted print. Lots of windfall to monkey around on. Fat Tire on the way out. Overall I had a fun hike on the Dosewallips. 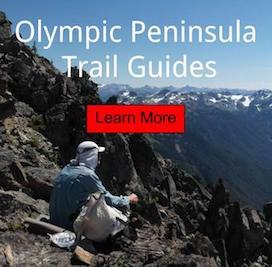 There is several parts of this adventure, where you can use those trails to walk across the Olympic National Park. Walking in these places, reminds me of that.